On July 23, 2005, I submitted an electronic Freedom of Information Act request to the Department of Defense seeking DoD staffer Steven Cambone's notes from meetings with Defense Secretary Donald Rumsfeld on the afternoon of September 11, 2001. Cambone's notes were cited heavily in the 9/11 Commission Report's reconstruction of the day's events. On February 10, 2006, I received a response from the DoD which includes partially-redacted copies of Cambone's notes. 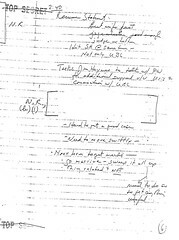 The released notes document Donald Rumsfeld's 2:40 PM instructions to General Myers to find the "best info fast . . . judge whether good enough [to] hit S.H. [Saddam Hussein] at same time - not only UBL [Usama Bin Laden]" (as discussed on p. 334-335 of The 9/11 Commission Report and in Bob Woodward's Plan of Attack). In addition, the documents confirm the contents of CBS News' Sept. 4, 2002 report "Plans For Iraq Attack Began on 9/11," which quoted Rumsfeld's notes as stating: "Go massive . . . Sweep it all up. Things related and not." These lines were not mentioned in the 9/11 Commission Report or Woodward's Plan of Attack, and to my knowledge, have not been independently confirmed by any other source. After the Rathergate fiasco, I wondered if CBS had been fooled into publishing a story that, from a publicity perspective, seemed too good to be true. Finally, these documents unveil a previously undisclosed part of the 2:40 PM discussion. Several lines below the "judge whether good enough [to] hit S.H. at same time" line, Cambone's notes from the conversation read: "Hard to get a good case." "Hard to get a good case." The thing that I think is a dead giveaway is the FACT that they DID start planning for war with Iraq on the day of even though Iraq had NOTHING to do with the attacks. Like they were waiting for 9/11 to happen. Just waiting for their "opportunity." Yes, exactly. Just "waiting" for 9/11 to happen. You may remember DoD staffer, Stephen Cambone, during a meeting with Rumsfeld on 9/11 jotted down "best info fast...judge whether good enough [to] hit S.H. [Saddam Hussein] at same time - not only UBL [Usama Bin Laden]." What we weren't told about at the time was that he also jotted down, "Hard to get a good case." To me, Rummy acted like a child with a $1,000,000 gift certificate to Toys R' Us. "I want that one, and that one, and that one." Certainly not someone concerned about the well-being of Americans affected by that tragic day. More like someone waiting for the opportunity.